Turn the perfect batch of dark chocolate devil’s food cupcakes into a fun treat! 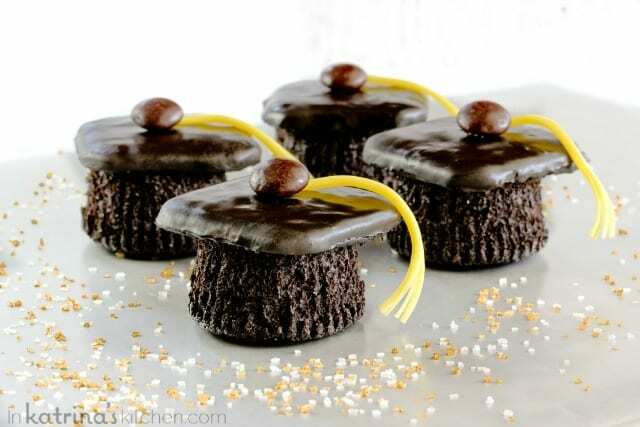 Use black food coloring to transform these delicious cupcakes into Graduation Cap Cupcakes. It’s graduation season! Wouldn’t these Graduation cap Cupcakes make the perfect little homemade gift for the graduate? Turn this unfrosted cupcake upside down and plop a frosted graham cracker on top and you only need a few pieces of candy to finish it off! Want to know my favorite part about these cupcakes? You can make them from scratch with the recipe I’m sharing today or you can use your favorite devils food cake boxed mix. Want to know what’s even better? You can whip up a whole batch of graduation cap cupcakes for a graduation party OR you can choose to transform a a few for that special graduate! Box them up in a cute bakery box or tin for a thoughtful gift. Turn the perfect batch of dark chocolate devil's food cupcakes into a fun treat! 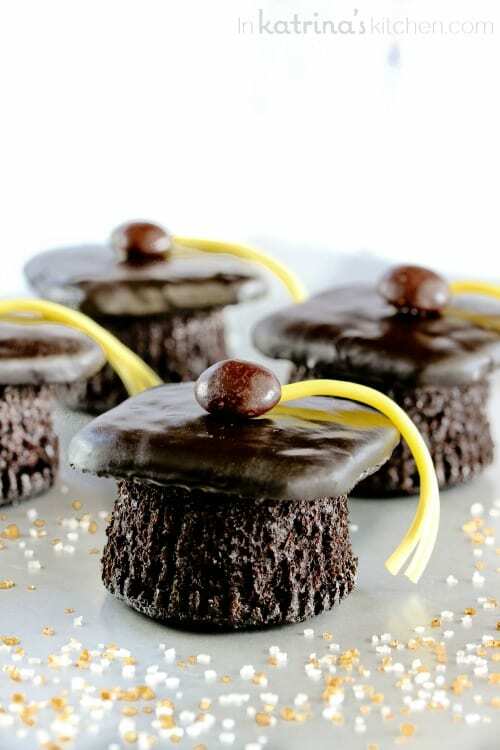 Use black food coloring to transform these delicious cupcakes into Graduation Cap Cupcakes. PREHEAT oven to 350°F. Line a muffin tin with 24 paper liners or coat generously with no stick spray. Whisk together flour, cocoa powder, baking powder, baking soda and salt in a medium bowl. Set aside. CREAM the butter and sugar until fluffy and lighter in color in the bowl of your mixer. Slowly add buttermilk, eggs and vanilla. Slowly add the dry ingredients to the wet ingredients in your mixer bowl until incorporated, about 2 minutes. Add up to 1 tablespoon black food color. Spoon batter into prepared tin, filling 3/4 full. BAKE for 15 to18 minutes until a cake tester or toothpick inserted into cupcake comes out clean. Cool cupcakes on a wire rack. PLACE frosting in a microwave-safe bowl and heat on HIGH for 1 minute until melted. Stir in 1 to 2 teaspoons black food color until desired color is reached. Using a fork, dip graham cracker squares into the frosting. Let excess frosting drip off. Place on parchment paper to cool and harden (at least 30 minutes). MEANWHILE, use sharp scissors to cut licorice strips into tassels. Unwrap cupcakes (if you used paper liners), trim tops to level if necessary, and turn cupcakes upside down. Use a drop of frosting to secure graham cracker squares onto tops of cupcakes. Place a licorice strip and a chocolate candy on top of each, securing with a drop of frosting. Make it easy and use a devil's food cake mix to prepare 24 cupcakes. Add up to 1 tablespoon McCormick® Black Food Color. If you are conservative with your frosting and let the excess drip off the sides of the graham cracker, one can (16 ounces) will be sufficient. I’m honored to have these Graduation Cap Cupcakes hosted on the McCormick website. As part of a larger promotion you can also find my recipe along with many other McCormick favorites available for free download on iTunes. Don’t miss this free download- available with iBooks on your Mac or iOS device, and with iTunes on your computer. Books can be read with iBooks on your Mac or iOS device. Awesome idea. Cupcakes are always a good idea!! These are amazing Katrina! Seriously, so creative. Naomi is the cupcake maker here for sure, so I will have to nudge her to make these for my nice next month. Love it! You might have to take over cupcake duties in a few weeks though! 😉 So excited for you guys!! These are so stinkin’ cute. I can’t even handle it. Thanks! Your boys would probably devour them like mine did! Ha! What a fantastic idea! These cupcakes looks just fantastic! Thank you! I’m glad you like the cupcakes! Those are absolutely adorable!!! Love, love, love it!!! How fun! Going to a grad party this weekend. Maybe I should bring these along. Have a great day Katrina! These are so fun! You are so creative! Love love love how creative these cupcakes are. My daughter is graduating kindergarten, I am so making these for her. Oh my gosh, this is the cutest idea ever! I love how simple it is- and it really looks just like a graduation cap! Pinning! These would be a hit at any graduation party! So cute! These are just adorable Katrina! So fun!